On 5 October, AKVorrat filed a complaint against mobile operator Hutchison Drei based on Drei's violations of net neutrality principles. Now the operator has given in and stopped the offending practice. At the same time, Drei has more than quadrupled data volumes included in its data plans, and in some cases has even increased them 17-fold. This shows that net neutrality is beneficial to service operators as well as customers, even though the telecoms industry would rather ignore the new net neutrality provisions in EU law. When customers use up all data included in their plan, Drei slows down their Internet connection or cuts it off altogether. However, for many years, services provided by Drei itself or by the operator's partners were excluded from this limitation. As such it wasn't realistically possible to use a service such as Netflix on a widely-used 4 GB plan, whereas the TV streaming service 3MobileTV, operated by Drei itself, could be used without restrictions. In this way, Drei used their control over their customers' Internet access to give their own services an unfair advantage. Customers' freedom of choice in which services to use as well as principles of fair competition between all service operators, from small start-ups to large established players, fell by the wayside. In early October, AKVorrat filed a complaint with Austrian telecoms regulator RTR against this violation of net neutrality principles. Even though the case appears not to have been concluded yet and the regulator so far has only stated that Drei has been asked to comment on the complaint, Drei has already reacted by changing their practices, at least in the case of new contracts. All ten of the services AKVorrat criticised are now advertised with a remark stating that they cannot be accessed when the data volume included with the plan is used up. 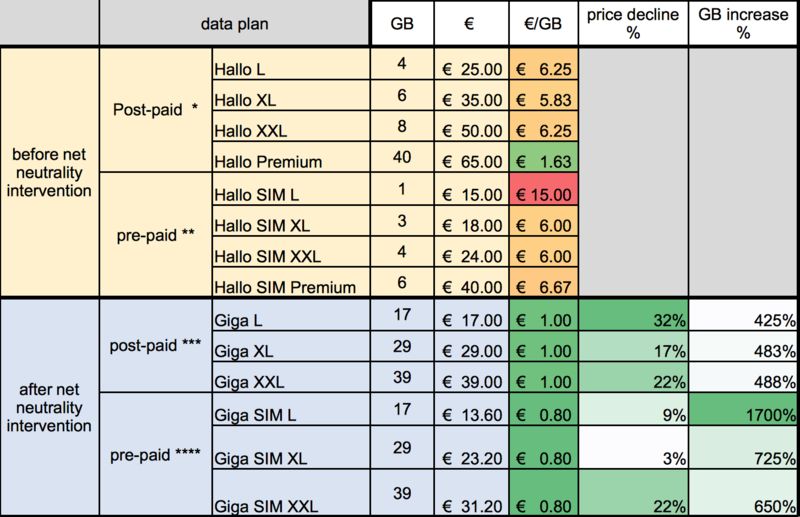 As was the case previously in the Netherlands and in Slovenia, the prohibition of preferential treatment of operators' own services has had a positive effect on the data volumes included in customers' data plans. In both of these countries, volumes have on average been doubled after zero-rating had been prohibited. Since AKVorrat filed their complaint, Drei has increased data volumes in all plans by at least 425%, in some cases even by 1700%. Whenever there is no business model to be built upon artificial scarcity of data, there are fewer incentives for operators to keep their own customers' data volumes low. Against this backdrop, on Thursday the three largest mobile operators in Austria started attacking the regulator RTR and its CEO. The operators criticised RTR simply for enforcing the new net neutrality provisions in EU law. Of course, this is exactly RTR's legally mandated purpose, and considering the recent developments in Austria's telecoms market, one can only be thankful that RTR takes its mandate seriously.